Ta Chan Kong-sang ny chloieder fillym China. Rug eh ayns Hong Kong, China, er 7 Averil, 1954. 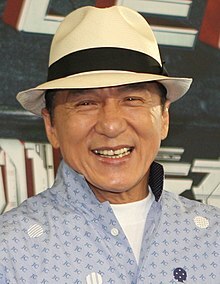 Ta tooilley coadanyn mychione Jackie Chan ry-gheddyn ayns Wikimedia Commons. Hie yn duillag shoh er ny reaghey er 30 Mee ny Nollick 2016, ec 00:05.